Twins bring double the joy and with that, double the work. Sleep deprivation with one child is bad but do twins spell double the sleep problems too? It is a well-known phenomenon that we are seeing more and more twin births these days, mostly because of infertility treatments. With in-vitro fertilisation up to five eggs may be implanted into the uterus at the same time, which greatly increases the likelihood of twins. About one in 80 pregnancies are multiple pregnancies. Two thirds of twins come from two separate eggs being fertilised. These become non-identical twins. Identical twins are created when one fertilised egg splits into two separate cells, and so the foetuses originate from the same cell. Once your twins are born, there are definitely much more work involved, and a strong structure and routine will be the only thing that gives you sanity in those hectic first six weeks. Don’t even think about demand feeding – you will run yourself into the ground! Get help, whether that’s your mom moving in with you or hiring a nanny. This is important, especially if you have a toddler as well. 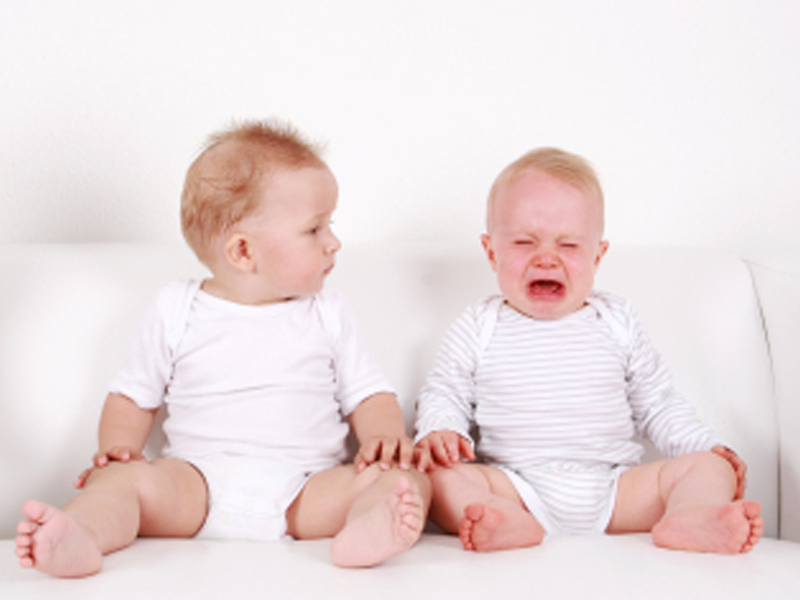 One twin may be more demanding than the other, which may throw you a bit, but once you know how to handle each baby, respond to their individual signals and work around that, life will start settling into a routine of sorts. It is possible to breastfeed twins. Some moms like to feed simultaneously with one on each breast, while some prefer to feed them straight after each other, a few minutes apart. You can also alternate their feeds; breast milk for one feed and formula for the next feed. Your body should be able to supply enough milk, but this depends on how much feeding stimulation your breasts get (either by your babies latching and sucking, or effective expressing) as well as your health. Many twins are born prematurely, which may cause some initial feeding problems. Persevere though, and you will be amazed at how quickly they “toughen up” ! If your babies are bottle fed, it is possible that they may need to be on different formulas! The same applies for solid food and meal planning. Remember they are two individuals, and may have digestive systems that function differently. Their nervous systems may also function differently. One twin may need more sleep than the other, and one may cope better with prolonged stimulation than her sister or brother. Remember to look at each baby as an individual. Routine is the key to keeping a structure that will ultimately lead to happier, more rested babies and a more relaxed mom. Set feeding times strongly. Do not demand feed Let them sleep together. They were together in the womb and being together can be comforting. Try to get them synchronised into the same routines of sleep, wake and play (even if the meals and activities may be slightly different), so that their body clocks and biorhythms are as similar as possible, but if they are very different, accept that they may be “out of synch” for some periods of time. Separate them from sleeping together if one is sick, if they keep very different awake and play times, or if you are trying to sleep-train one of them. Keep a log of all feeds and sleeps, as it is really easy to get confused about which twin has done what! Remember to still treat them as individuals, especially if one has sleep problems – it is impossible to sleep train both twins at once. If you have to do some controlled crying, separate them so that they don’t disturb one another. Enlist some support in the form of a night nurse or a family member who can take care of the “other twin” whilst you are sleep training. there will always be a stronger twin who will be “leader of the pack”, and who may be more advanced in certain developmental stages, and have a stronger character. If this is the case, it doesn’t mean that the other twin in “the weak one” – remember they are individuals – please treat them as such. Leaving the house with your twins in tow means that you will look a bit like a travelling circus! You will have lots of paraphernalia to carry with you, and will need to decide on things like whether you will have one or two nappy bags, and countless other variables. Make decisions that are the most practical and work for you. You may become a little socially unacceptable after the birth of your twins. A mother of multiples becomes an entourage with your two babies, and if you have toddlers even more so. Don’t fret! Find similar moms through an organisation like SAMBA (South African Multiple Birth Association on 0861 432 432 or www.samultiplebirth.co.za ) with whom to swap war stories, learn what to expect and engage in twin or triplet-friendly activities. Establish a structure and routine. Don’t try to be super mom. Involve your husband and other family members. This entry was posted in Baby, Prem & Multiple Births. Bookmark the permalink.